Shopping for the best double stroller for an infant and toddler is hard work. It can take as much research, effort, and time as shopping for a car. A great stroller that you can rely on makes going out with little ones a lot easier. Especially when you have two children. You’ll really appreciate somthing that can take them with you quickly, safely and with the minimum amount of fuss! 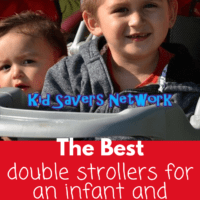 The Double Stroller Features You Need to Know! 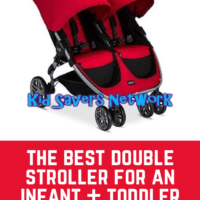 Strollers for Twins or an Infant and Toddler? 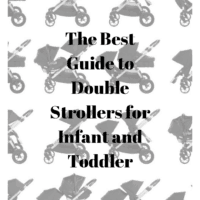 If you want to buy the best double stroller, there are a few things you need to consider. Firstly, you’ll need to think about where you’ll actually be using it the most. If you reside mostly in the suburbs, making sure that it fits in the trunk will be an essential feature for you. Does it fold down compact enough to fit where you need it to go? Next, a key consideration is how well the double stroller maneuvers. If it’s too big and bulky to get through crowds, doorways and grocery store aisles, you’ll end up using it less. 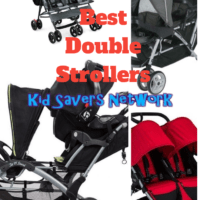 The best double strollers fold and compact nice and easily. 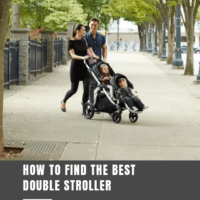 Strollers that use just one hand are the best – especially when you have two kids! Using both your hands means you won’t have one free for your infant – or to stop your toddler from running off! Does your double stroller need two full-size seats? Or are you looking for one that can grow with your family? Those with an infant and toddler should choose a model with a smaller second seat. If you’re looking for an infant stroller, a 5-point harness is also better than a 3-point harness. It’s also important (especially with newborns) that at least one of the seats fully reclines, too. For a versatile, jogging stroller that has great maneuverability, it’s hard to beat the Baby Jogger. It has a generous 16 different configurations! This will allow you to mix and match different seats, bassinets, and even car seats. You can also place the seat so you can look at your baby or they can see where they’re going. This is an important feature that a lot of tandem strollers just don’t have. The Baby Jogger is truly designed with the growing family in mind. It has a telescopic handle bar for better comfort and convenience. This is another great feature as it adjusts to your height when pushing the stroller. Which is great for you if you have a partner on the tall side! It also compacts very slim and can fit in most trunks of cars. The biggest drawback with this stroller is it’s still a bit bulky and a hassle to fold down. This is because you need to remove the seats completely to fold it. The other major drawback is the price. It’s much more than others on our list, but should last until your eldest is 4 years old (or around 45 lbs ). If you are having twins, you may want to pass on this one. However, if you are looking for a stroller for your growing family, the Britax B-Lively is perfect for you! 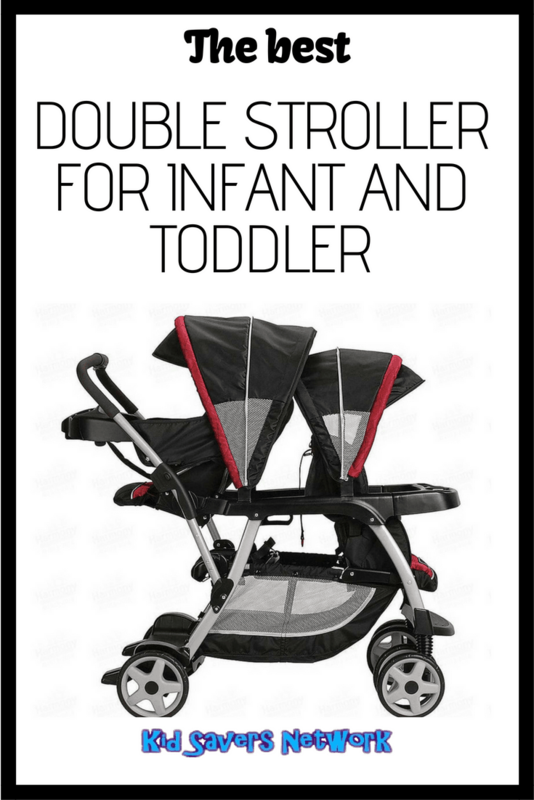 This side by side double stroller can fit a toddler and an infant easily. The only drawback is it can only fit one car seat adapter. This makes it a deal breaker for families of twins. Having said that, there’s a lot of storage for parents with multiple kids. Britax have made the storage basket bigger and more accessible in the 2017 version. There’s also a lot of pouches and pockets for wipes, cups, bottles and all the parent paraphernalia you need on a trip outside. Many parents love this model’s easy maneuverability, due in part to it’s super-lightweight aluminum frame. It can easily fit through doors and around tight corners. If you’re a tall girl or have a tall partner, there’s an adjustable handlebar to make things easier. This Britax double stroller also has a quick fold down design making it easy to compact and fold away. But as with many double strollers, it will need a large trunk space to be stored in. At just 26lbs, it could well be the best lightweight double stroller on the market today. The Baby Trend Sit N Stand is great if you have twins or if you just need it for your growing family. There are multiple riding positions making it accommodating to your child at any age or developmental stage. Older kids will love the ability of the sit and stand feature. They can easily walk if they want to or hitch a ride on this tandem stroller. The drawbacks with this model are the same that many front to back double strollers have. While you don’t have any worries about getting through doors or around people, the turn capability and maneuverability is a bit more difficult. The Sit N Stand stroller is definitely not one that you would be able to push with one hand. It also doesn’t compact down as neatly as one would like making it too bulky to fit in some trunk spaces. 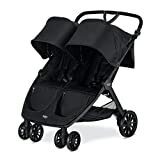 At a fraction of the cost of other strollers on the list, we believe this is one of the best budget double strollers. You can click here to check today’s price on Amazon. 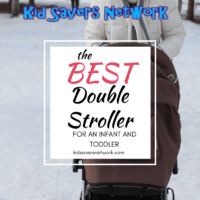 The Graco Modes Duo Double Stroller was one of the top rated double tandem strollers by parents in 2019. One of the best things about this design is it can be folded easily using only one hand. It also has stadium-style seating to ensure that both children have a good view. Another great feature is the extra storage, which is really desirable when you are out with two little ones. Unfortunately, this model only features a 3 point harness. While this may be okay for older children, many with infants prefer a 5 point harness as it helps keep them secure and in place better. As it is a front to back double stroller, it should fit in most SUVs and vans, but it might not fit smaller sedans. You need to take all this into consideration, but no stroller is perfect. At its current price point, the Graco DuoGlider is still a good buy. You can find today’s price on Amazon here. 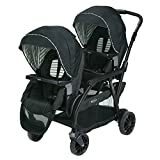 If you are looking for the best double stroller for travel, this may be the perfect model for you. In general, umbrella strollers are great for airports and theme parks. They are lightweight, compact and easy to tote around. The Delta Side by Side Stroller has all the great features of a regular umbrella stroller and more. It has a 5 point harness and two storage bags which are uncommon with umbrella strollers. It’s probably the best lightweight double stroller for travel. Though it has its drawbacks! One is that the visor is too small. The canopy barely covers the seat. Another is that the seats are not anchored to the stroller. 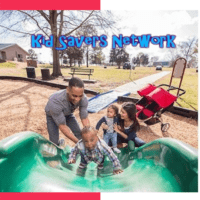 If you have a restless child who is always looking for a way to break free, they can easily pull themselves forward even though they are strapped in. Still, for its budget price, the Delta Side by Side double stroller is perfect for travelling tots!